Do I Work with You Or a Paralegal? For many people, their first experience working with an attorney is when they decide to sit down and create an estate plan. If you fall into that category you may have a number of questions concerning the attorney-client relationship. For example, you may want to know “ Do I work with you or a paralegal? ” Although every law practice operates a bit differently, there are some common methods of operation used in most law offices. Knowing a bit more about the attorney-client relationship and how most law offices operate may put you more at ease when you decide to work on your estate plan. Receptionist – responsible for greeting clients, answering phones, and sorting mail. Secretaries – responsible for scheduling meetings and court dates, organizing files and typing correspondence for attorneys as well as communicating with clients. Accounts payable/receivable – keeps track of payments by clients as well as pays bills of the office. Investigators – locates and speaks to potential witnesses, gathers evidence, researches documents. Runners – files documents with the various courts and picks up/delivers documents by hand within the city. Paralegals – responsible for doing legal research, drafting some legal documents and briefs, and may be the primary point of contact for clients. It is common for paralegals to have extensive contact with clients, particularly when the attorney in questions has a large caseload and/or spends a considerable amount of time actually litigating cases in court. Although a paralegal is not an attorney, a paralegal does have specialized training that allows him/her to understand much more about the law than the average person. For this reason, many questions can be answered by your attorney’s paralegal, particularly if they are procedural questions or questions relating to the status of your case. A paralegal cannot, however, give you legal advice. Think of your attorney’s paralegal as his/her “right hand man/woman.” While you should always be able to speak directly to your attorney when you need to, working with a paralegal is often more efficient when you do not truly need to speak directly to the attorney. Of course, if you are not comfortable working with a paralegal you should not be required to do so. 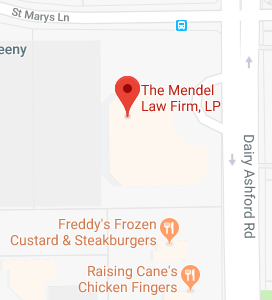 If you have additional questions or concerns about your Texas estate plan, contact the experienced Texas estate planning attorneys at The Mendel Law Firm, L.P. by calling 281-759-3213 to schedule your appointment today.